When I review a product, I write my personal opinion about it. To give you an imagination what I take into consideration, I will now give you an insight into my review process, my testing requirements so to say. This should help you to understand what I think about, what I like, what I try to avoid regarding beauty products. First of all, before I can review a product, of course I have to try it. Some products can easily be reviewed: an eye liner is suitable for me – or it isn’t. When it comes to shampoos, moisturisers and so on, I have used them over a longer period to get to know them better. Therefore, I cannot say that I have used every single product for the minimum of 6 weeks or so, sometimes the period is much shorter or longer. What I can say is: I do not review a product that I don’t have an opinion about all by myself. To begin with, there are the ingredients. Vegan/cruelty free: I like vegan products. And I like to know if a product is vegan on first look. So if a manufacturer provides this information I’m happy. The more information, the more happy. The more reliable information, the more trustworthy-happy. A product should at least be cruelty free (without animal testing) and the manufacturer should provide this information on the container. So give me at least one of these informations, please! Vegetarian: Okay, not every product is vegan. If ingredients like honey, beeswax, milk, propolis or silk are used, they should be derived from sustainable farming, be organic, whatsoever you like to call it. When a product contains bees or cows (or … ) products I want to be sure that the animals have not been harmed but had a good life instead. Demeter is one of the best certificates to get for vegetarian products, and this one I like the most. But I am pleased enough if the vegetarian products are marked with some “organic” or “cruelty free” in the INCI list. Certification: For simpler identification I like certificates. If there is a label on the product which I know ensures a good product, that saves a lot of time. I like Natrue, BDIH, EcoCert, ICADA, Demeter, KRAV and USDA organic. Organic: I want to know how much of the product is organic. For me, 70% of the whole content to be organic is a good sign. If a product contains water, it better not be too much of it, because that lowers the percentage I’m after. A manufacturer could instead use aloe vera or apple juice, some hydrosol or whatever, but why add water? I have high standards, and I want the producer to give me answers to the organic-question on the container. Some packaging provides just that information, which is user friendly, and that should be standard. Promoted ingredients: If a manufacturer promotes some ingredients for a product, in my opinion these ingredients should be placed in the first five spots of the ingredient list. It is a no-go for me to place a promoted ingredient after perfume or after a preservative. Fillers or cheap basics: In the ingredients list, I do not like to have known low-cost things in the first three spots. 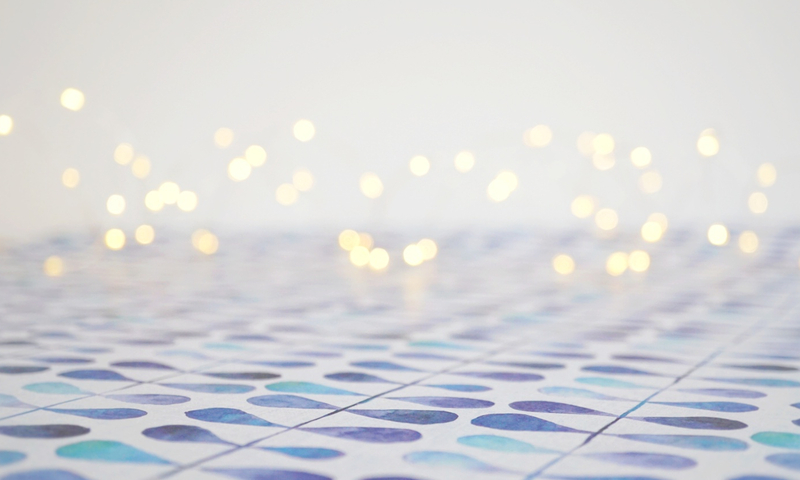 The ingredients that are the base for any product should be really good for the skin (not average), and I do not think that water, glycerine, alcohol, talc, hybrid oils and so on make a product any better than average – these materials usually save the manufacturer money. Colourings: If the product stays on the skin, there should no colour be added. Regarding make-up, only natural and vegan colours should be used (no petrochemicals). Perfume: Call it what you like: perfume, scent, aroma, fragrance, … . I want to know about every single ingredient in the products I use. At least, it has to be some “blend of natural organic essential oils”, but in no way just perfume or aroma. Even a non-organic blend or a “blend of only ingredients of essential oils” does not fit my requirements. Best case: the essential oils are listed and are organic. But I’m okay with the full declaration, though. Palm oil: I want to know without further effort if palm oil is used to make the product. If I do not get this information, lets say for emulsifiers, how can I know? When palm oil is used, it should be organic or from sustainable farming. Preservatives: Sometimes even a certified product may contain preservatives. You know, manufacturers could avoid preservatives via using smart packaging as airless containers or pump bottles. I like a preservative free product more than one that contains some. Also the packaging means a lot to me. Full size and travel size: Do you get the option to choose a smaller size before you buy the full size? Maybe you don’t like the product, or it does not suit your skin condition, and not using up a product is the same as waste. And if you like the product, are there re-fillers available or super-size bottles? Glass, re-usable: Is the packaging reusable, recyclable, or at least in some way environmentally friendly? Is the container stored in a cardboard box and if so, is that necessary? Go for clever containers! Appropriate packaging: Sometimes, ingredients must not be exposed to sunlight. Such products should not be put into clear glass bottles but instead in blue or brown glass. Also, if you pay a lot of money for a product and it comes in a cheap plastic bottle, that is not appropriate. In that case, the look and feel of the container does not fit the exclusiveness of the product. With better ingredients there comes the duty to make you aware of what you use so you can appreciate it more. Practical packaging: Think about a shower gel that slips out of your hands in the shower twice a week. Or a lotion that claws itself into a glass bottle and stares at you, laughing, because the pump does not get out the products. That is so not practical! Also, if you can’t (with the product on your palms) hold the container without being afraid that you drop it, that is poor packaging. INCI: Somewhere on the product itself, the packaging or at least a note that has been added to the product you should have the full ingredients list to take away with you. 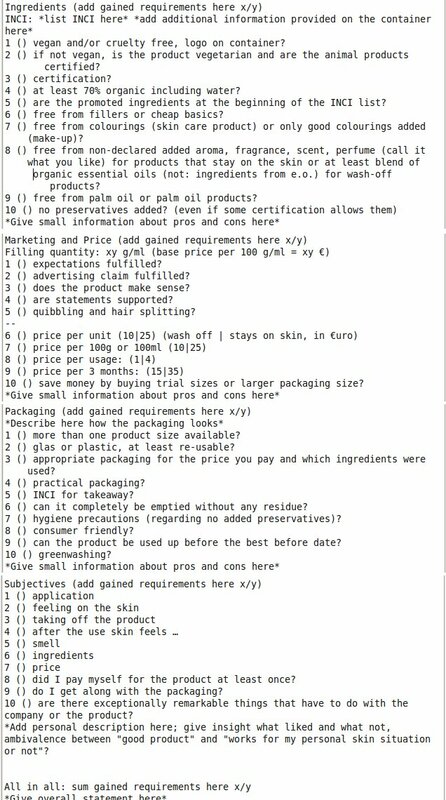 And not just some ingredients list, I talk about the INCI, that means the “International Nomenclature of Cosmetic Ingredients”. In the INCI list, the ingredients are listed in a descending order of weight (above 1%). If the content of the ingredient is less than 1%, there is no order forced. Empty: Can the container be emptied without residue or does a rest remain in there nevertheless how willingly I try to get it out? I am no friend with packaging that by construction leaves some product in the container which you have to throw away. Hygiene precautions: Is it possible to get the product out of its container without placing bacteria and other stuff in it? Creams in glass containers could come with a spatula or with a hinged lid at the bottom so that no air circulation at the surface of the product is possible. You get the point. Consumer friendly: Does the packaging provide additional information that is good to know for the user? Every trustworthy label or manufacturer information about in-house standards is welcome. Best before date: Can the product be used up before the best before date? Sometimes, the sizes are too big so you might throw away some remaining product because you are no longer sure if it is safe to use up the product (or if you smear some bacteria growing cream on your skin). Greenwashing: Are there labels that make you think to buy something which isn’t the case? Let’s take a label that says “with organic ingredients”, but the only thing you can read on the tiny little label is the word “organic”. So the label makes you think that you buy some certified organic product, but instead you may get an uncertified product with some organic ingredient in maybe small amount. Also, if no other label can be put on a cardboard box, sometimes you find some FSC-label. That is not bad, FSC is the “Forest Stewardship Council”, a not-for-profit international organization setting standards and certification for environmentally responsible use of commercialized forests. But if you buy cosmetics, you think the label on the product tells something about the ingredients or standardisation. So if no other label occurs on a packaging – that might be greenwashing, too. … are also very important when you buy a product. If you can’t afford a product or do not want to re-buy it because that would be too expensive for everyday or weekly use, that’s a pity. Even the best product only works if it is in your bathroom waiting for you to use it. And worst, what if it does not meet your expectations? Are the promises fulfilled or not? Expectations: When you buy a product you have expectations. Is the product made in a way that it can fulfil these expectations? Lets say you buy a shampoo with gentle detergents, but you can’t get your hair clean with it. That’s a fail for me. My personal expectations arise from buzzwords or pictures on the front or look-and-feel of the packaging. Advertising claim fulfilled? Mostly some PR phrase tells you something like “better skin in four weeks” or “shinier hair after 10 uses”. In the running text often some advertising claims make you believe that you can become a second Naomi Campbell when using the product. So have there promises been made or something that could easily be read as a promise (while it isn’t), and has it been fulfilled? Does the product make sense? If you have a day cream with ingredients that don’t tolerate sunlight and will break down into some nasty things, that does not make any sense, right? So such ingredients should be put into a night cream. Another example would be a wrinkle cream advertised for someone at the age of 20. I say: at that time you do not have any wrinkles. Instead, a moisturiser for the delicate eye area would be great, for those who use a lot of eye make-up. Are statements supported? If a product is dermatologically tested, that does not say anything about the outcome of the test. The test could be a total fail! If there are any statements on a product, I want to get valid information what such statements mean. If a manufacturer has no verification about the positive outcome of a test, this information should not be provided at all. Quibbling and hair splitting? I hate quibbling. If a product is labelled to give you “healthy looking skin” that does not imply that this product makes your skin healthy. By hair-splitting like this, a manufacturer makes you believe that you buy something good which might not be the case. If a cream causes swelling and therefore wrinkles a bulged up, your skin seems more smooth. But do want to get a swelling around your eyes to get rid of some wrinkles? It would be better to use something that actually helps your skin to store more water or produce more collagen or whatever, and if something guides you the wrong way that makes me very angry. Price per unit: I think it is okay to spend (10|25) €uro for a (wash off | stays on skin) product. I do not print my own money. Price per 100g or 100ml: Sometimes a tiny amount of (wash off | stays on skin) product sums up to lots of money when calculated for 100 grams or millilitres. For me, again the price of (10|25) €uro is an indicator. Price per usage: If you have a weekly or monthly treatment, the price might be higher. My magic limit is (1|4) €uro. Price per 3 months: By know you know that all price is relative. What does it cost to use the specific product according to the instructions given by the manufacturer (or, if the amount used in reality is higher, the actual amount). If I want to regularly re-buy a product, that price should not be more than (15|35) €uro. Save money: Can you save money by buying travel sizes (if the product is not used regularly and you do not want to throw away something after the best before date), bulk sizes or refill packages? If you do not have to throw away product or packaging too often, that is additionally good for the environment. The most important thing for me, while using a product, is that I like the product and that the product fits my needs. I will think about the application of the product, how it feels to have it on my skin and to take it off, also about how my skin behaves after the use. The smell, ingredients and personal feeling about the packaging and price (good value for the money or just cheap?) are essential for my review, too. Another significant question is: did I pay myself for the product at least once? Which means: have I been willing to spend my own money on the product? Not to forget that some companies have exceptionally remarkable things to say about them; be it a women’s cooperative that is supported, the company works with disabled people or integrates someone special or something else like that. So I wrote me a chart to copy & paste. I can easily fill up the () with an (x) or a (-) and after that sum up the number of met requirements. If I do not get the information I’m after at once (means if it isn’t readily available on the product or my common knowledge), I will state the requirement as not fulfilled. Anyhow, I will not provide you the chart in my reviews. I will just give an overall opinion and tell how many of my requirements have been met. If not so many requirements are fulfilled that does not mean that the product is a bad one. That just states that this product does not fit so well into my personal scheme of what is important for me. So please, think of your own about if my requirements are your requirements. Besides, my own subjective perception can differ from my own objective insights. A product can have very good ingredients, high-level packaging, you know: a dream (from the distance). Apart from that it is possible that my skin does not get along with the product. Vice versa, too! I know that it is very hard to achieve 100%, maybe impossible. But if you set low standards, you will get low results. With this blog I’m on my way from using “good” products to using “great” products. Be aware of the very high expectations I have and you can see my reviews as complaining on a high comfort level. Have this in mind while reading my reviews, don’t you?